How Do I Find Out How Much an Old Sewing Machine Is Worth? The worth of an object, is simply what a person is willing to pay for it, so it could vary greatly depending on several factors; including, age, condition, and brand name. 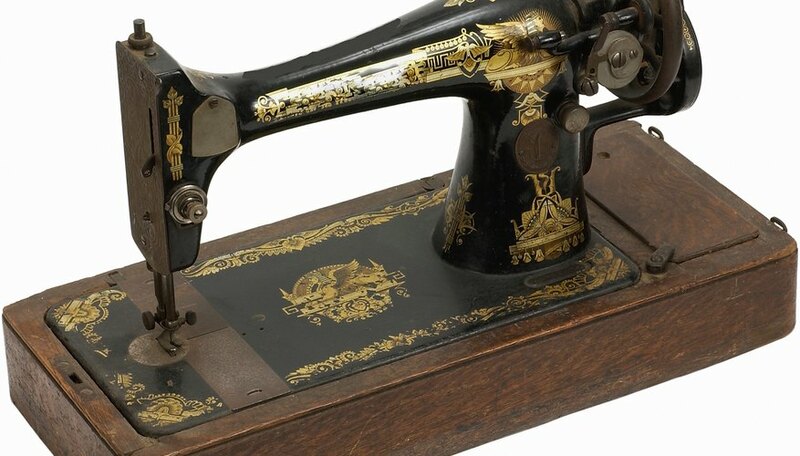 For example, an 1878 Bradbury recently sold on eBay for nearly $900, while a newer Singer brand sewing machine can be purchased for less than $50, brand new. If you have the product manual, it should list the make and model right on the front of the brochure. If not, you need to dig a little deeper. Before consulting other sources, be sure to inspect the machine itself for any names, numbers, dates, or defining marks. If the machine is missing defining marks, or branding, all hope is not lost. Although it could take a great deal of time, an image search, using your favorite search engine, may just be your best option. Here, you can visually search through old sewing machines, and hope to find one like yours. You can also post a photo on any sewing-related forums that you may find. The more experienced members should be able to identify it for you. Remember, when posting in forums, that for an item to be considered an antique, it should be at least 100 years old. Anything newer, is simply considered an old sewing machine, although they could still be quite valuable. Consult a few sources that may be able to give you a better idea of what sort of average price your old sewing machine is selling for, as this is generally the best indication of true value. Amazon, and eBay are the two easiest options for pricing just about anything. With eBay, search completed auctions. To do this, simply click on "advanced search" near the top of the page, and select the box that says "completed listings." Enter the make and model of your sewing machine into the search field. The next screen should bring you results, if they exist. You can drill down the content even further by clicking on the "used" box in the left sidebar. This should give you the results you need to accurately price your old sewing machine. Simply enter the make and model of any product on the Amazon website, and you'll get results that closely match your product. If your sewing machine is indeed old, it's probably used, so searching for new products on Amazon won't do you much good. To ensure that you find the correct price, look for the links under the delivery information section, and you should find links for new, used, and refurbished items. If the online search fails, it's time to break out the yellow pages. You probably have a sewing shop somewhere near you, or at least a shop that repairs sewing machines. It may work to your benefit to bring the sewing machine into one of these shops, and see if they can help you. Sewing machine repair shops are quite knowledgeable in identifying these machines, and they may be able to tell you just what yours is worth. If all else fails, you aren't completely out of luck. There are always antique shops, flea markets, and even pawn shops. The employees that work at these types of places are trained to be able to identify just about anything. If they can't identify it, odds are that they know someone else who does.